Valencia is Spain’s 3rd largest city with a population of around 740,000. It lies on the Mediterranean coast some 350km south of Barcelona. Madrid is a similar distance inland but is now only 1½ hours away thanks to the high speed AVE rail link. No other city in Spain has seen such a transformation as Valencia has since my first visit in the early 90s when there wasn’t even a motorway connecting the two cities. The opening of the different parts of the City of Arts and Sciences between 1998 and 2005 marked the beginning of the urban regeneration that would put the city on the map as a European tourist destination but would ultimately lead to the region becoming the most indebted in Spain as the Spanish economy teetered on the brink of collapse. The city is littered with expensive capital projects that could not be financed including the beautiful marina area which hosted the 2007 America’s Cup and the Formula One racing track in the city centre that allowed Valencia to stage the European Grand Prix for four years. The biggest ‘white elephant’ is Castellon Airport just up the coast which cost €150 million Euros to build and has never saw the arrival of a single flight before Ryanair set up a connection with London-Stansted. The economic profligacy of the Valencian regional government and the corrupt actions of too many of its officials reflects everything that has gone wrong in the Spanish economy as a whole. But how does that affect you as a tourist to this fabulous city? The answer in a nutshell … not at all! The city I visited before all the economic madness is still there. To confirm this just head to the top of the 14th century Miguelete bell tower for a look at old Valencia then head off to discover this modern city where the traditional way of life is never far away. Comunidad Valenciana Beyond the city of Valencia is a whole region known as ‘La Comunidad Valenciana‘ which is one of Spain’s autonomous communities. It stretches from Catalonia in the north to Murcia in the south and is made up of the provinces of Castellón, Valencia and Alicante. The region as a whole attracts millions of visitors every year, mainly to its holiday resorts along the Costa Blanca. Climate: The Valencia climate is controlled by its proximity to the Mediterranean which produces many clear, sunny days throughout the year. Summer temperatures are hot but without being too stifling and in winter the daytime temperatures are pleasant although a little cold at night. On average there are only 44 rainy days a year and many of these are from October to December. The rain starts with the arrival of the ‘gota fria’ which is a local weather phenomenon. Below is the current Valencia weather and the latest 4 day forecast followed by two graphs showing average monthly temperature and rainfall information for the whole year. Flights: Valencia Airport lies just 8km west of the city of Valencia. Whilst there are flight arrivals from a number of European cities the airport isn’t particularly well connected considering it serves Spain’s 3rd largest city. Thanks to easyJet and Ryanair there are some budget operators offering international flights to Valencia all year round and some additional services do appear during the summer months. If you’re heading for holiday destinations along the Costa Blanca you’re far better off flying to Alicante. There are plenty domestic options available from Madrid and Barcelona. Train and Bus: If you’re already in Spain then train services from Madrid and Barcelona are excellent and intercity bus services are available from all over the country. Cruise Ship: Upward of 450,000 people per year arrive in Valencia by cruise ship making Valencia Port one of the most popular destinations in the Western Mediterranean. The fastest way to get into the centre is to take the underground train (lines 3 or 5) which runs from the airport to Carrer de Colón in about 25 minutes. Alternatively, you can take the airport bus (Aerobus) which runs every 20 minutes from the airport to the city centre. There’s also a local bus (line 150) which goes from the airport to the city via Mislata, Quart de Poblet and Manises but takes 45 minutes. As you’d expect, taxis are always available outside the arrivals area otherwise you can pre-book private transfers and have a driver waiting for your flight on arrival. These specialist shuttle companies can usually cater for any group size and will provide transfer services to all destinations in the Valencia region. If you’re only visiting the city of Valencia then it’s not a good idea to bother hiring a car as you’ll be able to get around the city on foot and by public transport. But if you’re actually travelling on to a final destination well beyond the airport or touring the region then you’d be as well booking a rental car to collect at Valencia Airport. 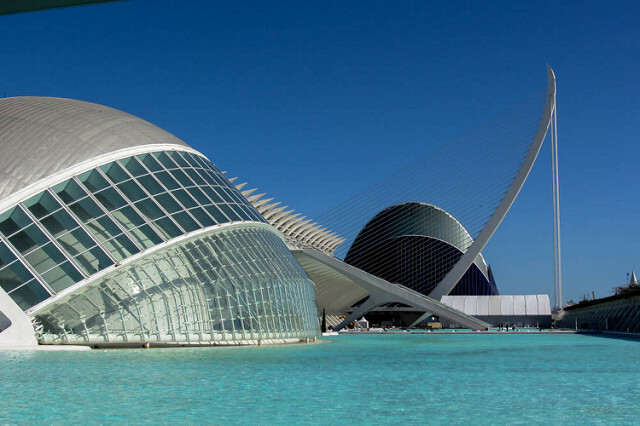 The major tourist attraction in Valencia is the amazing City of Arts and Sciences which attracts 4 million annual visitors and is equally fascinating to adults and children alike. The city is now firmly established on the European art circuit with galleries containing works by El Greco, Francisco Goya and Diego Velázquez. Of more historical interest are the Cathedral which has reputedly been home of the mythical Holy Grail for the past 500 years and the Miguelete bell tower next to it. The city’s silk exchange, covered market and bullring are other major attractions. Art enthusiasts are in for a treat at the ‘Museo de Bellas Artes’ and the ‘Instituto Valencia de Arte Moderno’ which are two of Spain’s finest art museums putting the city up there behind Madrid and Barcelona on the Spanish art scene. City of the Arts and Sciences: The City of Arts and Sciences (Ciudad de las Artes y de las Ciencias) is an enormous complex which is undoubtedly Valencia’s number one tourist attraction these days attracting over 4 million annual visitors. It has more than enough to keep all the family entertained for a full day. Palacio de las Artes consists of auditoriums for the performance of plays, opera and music in conjunction with all the latest technology. For the latest information on transport options, opening times and entrance fees take a look at the official website of the City of Arts and Sciences. Valencia Cathedral: The particular claim to fame of Valencia cathedral is that it has reputedly been the home of the mythical Holy Grail (the chalice Jesus used at the Last Supper) for the past 500 years. In Plaza Zaragoza where the Cathedral stands is an unfinished 47m Gothic tower called the Miguelete which dates back to the 14th century. It’s well worth climbing the tower to get a great view over the city towards the agricultural (huerta) lands beyond. 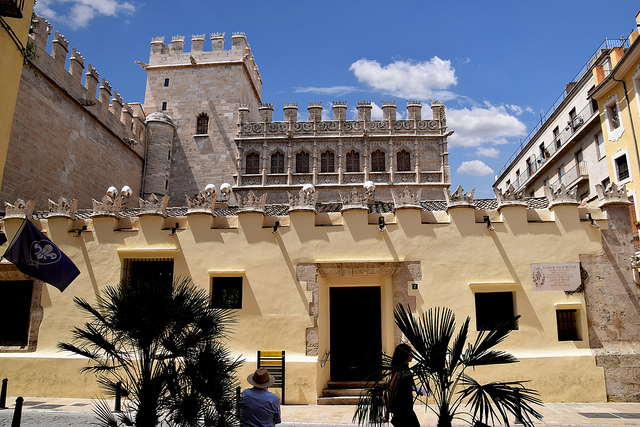 The Silk Exchange: This beautiful former silk exchange (La Lonja de la Seda) was built in 1498. Today it is a Unesco World Heritage site. Palau de la Generalitat: This is a 15th century Gothic building which is the government building of the region of Valencia. Mercado Central: The city’s central market dates back to 1928. It is well worth a visit to experience the hustle and bustle as shoppers and traders go about their business among a fascinating array of fruit, vegetables, meat and fish stalls. 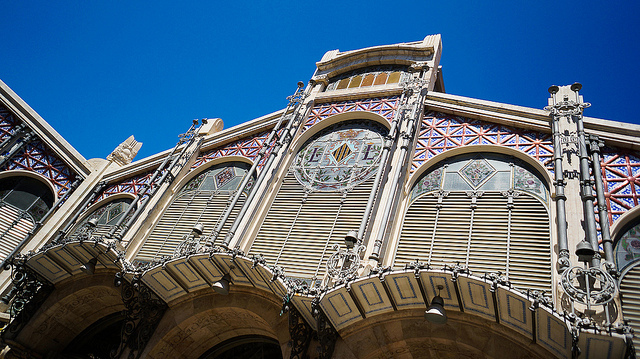 Valencia’s Bullring: Valencia’s Plaza de Toros is one of the largest bullrings in Spain. It lies next to the train station at Calle de Xátiva 28. Bullfights take place every day during the Fallas festival in March though tickets are difficult to get hold of. Instituto Valencia de Arte Moderno (IVAM): contains an impressive collection of Spanish modern art and was responsible for firmly adding Valencia to the list of European art centres. It lies near the Torres de Quart, 15th-century towers which face towards Madrid and guard the entrance to the city. You can see marks at the top of the tower left by cannonballs fired by Napoleon’s troops during the 19th century invasion. Museu San Pío: is a fine collection of art with a particularly Flemish and native Valencian flavour. It includes works by Velazquez (look for his self-portrait of 1640), Goya, Bosch, Morales, El Greco (St. John the Baptist), Ribera, Murillo, and Sorolla. Museu de Belles Artes has one of Spain’s best general collections and includes works by Velazquez, Goya, El Greco as well as plenty Valencia modern art. Museu Fallero: This novel museum displays some of the best creations from the previous Fallas festival which allowed them to escape being burnt. Museo Nacional de Cerámica: The Valencia region is the capital of Spain’s ceramic industry most notably as the home to Lladró porcelain. This interesting museum exhibits examples of ceramics from all over the world. Located in front of the Palacio de Congressos, the Eurostars Gran Valencia Hotel is a five star establishment offering 110 tastefully decorated guestrooms. This hotel comes highly recommended. Located right in the heart of the city with an excellent restaurant. The Hotel Husa Dimar occupies a privileged location near Canovas Square. It is not likely you’ll find a more centrally located or more convenient hotel in all of Valencia. Impressive building offering easy access to both the historic centre of Valencia and the nearby coastal areas. Small and cosy hotel located right in the heart of Valencia’s historic centre. The Expo Hotel Valencia is located in the city’s Nuevo Centro, only metres from the Congress Centre and the IVAM (Museum of Modern Art). The Catalonia Excelsior Hotel is housed in a distinctive building from the mid-twentieth century and is centrally located. Check out Booking.com’s special deals on hotels in Valencia from where you can easily access the city’s main tourist attractions. This property used to be a modern hostel called Rooms Deluxe Hostel located close to the City of Arts and Sciences. It features themed rooms with premium amenities. Each room is decorated by a different artist. Visitors can stay in the flamenco suite for a more tropical feel, or enjoy a relaxing holiday in the Mediterranean room. All apartments are equipped with a large kitchen, air conditioning, free wireless Internet, refrigerator, children’s area, televisions, and heating. The Red Nest Hostel offers clean and cheap accommodation in Valencia. It’s located on one of the most important streets of the city, so you can easily explore the surroundings. This friendly, colourful hostel is ideal for solo travelers. All rooms feature air conditioning, outdoor terrace, free Internet access, huge kitchens, free city maps, and bathrooms with showers. Visitors also have access to free towels, washing machines and hair dryers, security lock boxes, fax services, and special areas for reading and relaxing. The hostel offers budget-friendly three-course dinners for its customers. Travelers can opt for private double rooms, female rooms, male rooms, mixed rooms, and mixed dorms. While most hostels offer bunk beds, the Home Youth Hostel features comfortable, spacious dorms with no more than four beds per room. This place boasts a fun, vibrant atmosphere and enjoys a great location next to the UNESCO World Heritage site of the Silk Exchange. The Quart Towers, the Serranos Towers, La Lonja, snd Plaza de la Reina are within close proximity to the hostel. The Center Valencia Youth Hostel is the newest hostel in town. It is located close to the Central Market, Torres de Serranos, and Basílica de los Desamparados. This place is ideal for single travelers, groups, and backpackers. 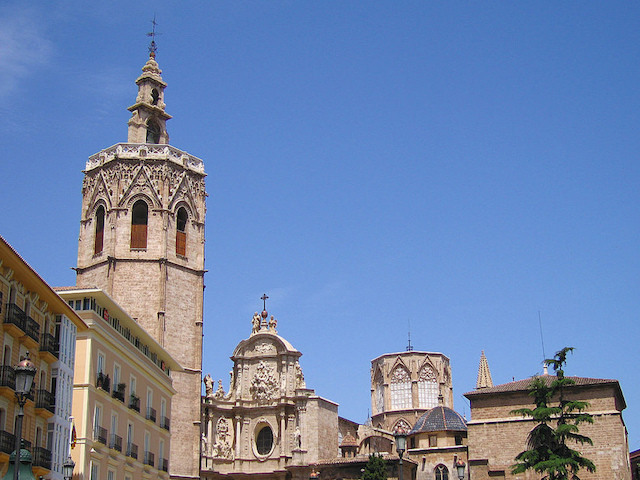 It’s situated in the old part of the town, next to Plaza de la Virgen and the Cathedral. The Valencia region is home to ‘Paella Valenciana’, Spain’s most famous dish. Many restaurants in the city offer a selection of rice dishes including paella and a lesser known dish called ‘Fideua’(noodle paella) which is well worth trying. After dinner head for the bars and nightclubs around Barrio del Carmen in the old city where Valencia’s notoriously lively nightlife goes on. Here you can try an ‘Agua de Valencia’ which is a very tasty (and potent) champagne cocktail from the city. This outstanding restaurant offers some of Valencia’s top seafood in the haute cuisine category. The seafood stews are a favourite as are the crust “cigala”, Viver suckling lamb with parsnip cream and the rhubarb crepes. Tito Albacar continues to update Valencian Cuisine artistically and with great culinary results. Salvador, his brother, is in charge of the wine cellar and service. Highly recommended are the curry crawfish salad, hot foie-gras with young pigeon and French beans and the coffee parfait with rhum. A Galician restaurant with exceptionally high quality seafood transported down from the Atlantic coast. The daily recommendations should be considered. Specialities include fine pasta with “zamburiñas”, anglerfish with squid and gin butter, curd with sugar ice-cream. Excellent wine selection. A very popular seafood restaurant frequented mainly by Valencianos attracted by excellent quality cuisine. Probably the city’s top seafood spot. The fish baked in salt (a la sal) comes highly recommended. A Valencian restaurant offering imaginitive regional specialities such as grilled cod with green peppers. Quaint setting in a 1910 townhouse. Closed Sundays, Easter and August. No dinner on Sundays. Locally renowned as the King of Paellas, this moderately priced restaurant offers a variation on the classic Paella Valenciana. This great value restaurant is the place to head for to enjoy authentic Valencian rice dishes. The paella valenciana is obviously the most popuar dish amongst visitors, but also worth a mention are the fideuá (paella with noodles instead of rice) and the fresh fish dishes cooked with garlic and pepper (all i pebre). This wild west theme restaurant offers a great selection of dishes which include typical Spanish tapas, delicious Tex Mex meals and a selection of sandwiches. Staff speak English and French.